On September 17th, the seventh web-based seminar of the European Rewilding Network took place and this time members from several rewilding sites in Europe discussed how to restore food chains and the ways rewilding contributes to this. 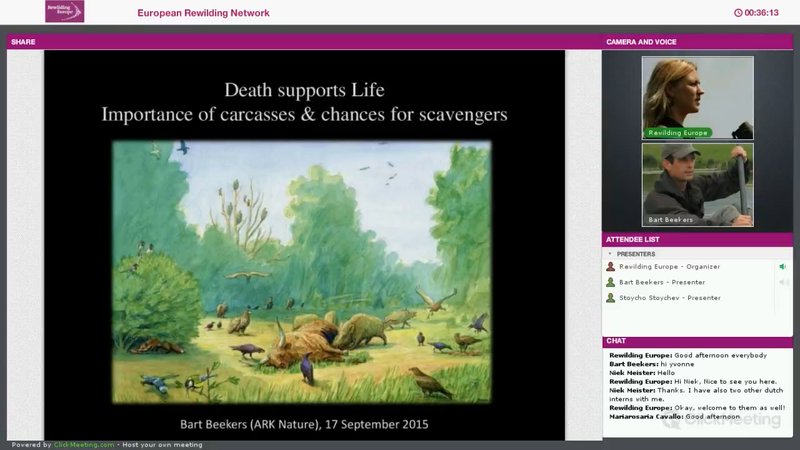 The webinar specifically addressed the crucial importance of dead animals in nature and consequently the chances for scavengers feeding upon them, all to restore natural food chains in our European ecosystems: the Circle of Life. Within the European Rewilding Network (ERN), members are keen to actively share experiences on rewilding related topics with one another. Lessons learned and innovative approaches are exchanged, which broadens each other’s knowledge and stimulates the ongoing rewilding efforts in member areas. The online seminars -known as webinars- prove to be a great tool to ensure a vivid exchange of expertise within ERN. This time the webinar focussed on various ways to restore food chains, which is of vital importance for scavengers such as vulture species and many others. Members from several rewilding sites across Europe attended the event in which two speakers from very different localities shared their experiences. 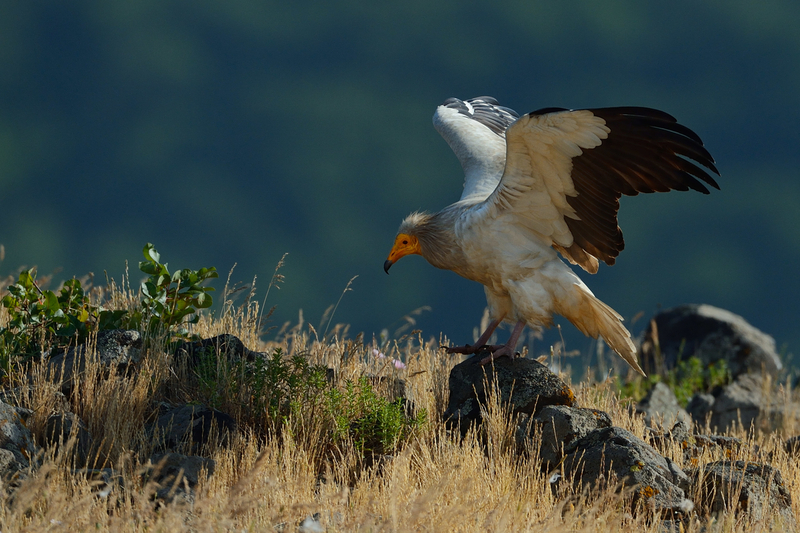 Egyptian vulture, Neophron percnopterus, Madzharovo, Rhodope Mountains rewilding landscape, Bulgaria. First, Bart Beekers from the Dutch organization ARK Nature presented details concerning the ecological role of dead animals, from the Green-bottle fly to the Red kite, and outlined their importance to other species. Bart has been involved in the project ‘Death supports Life’ for many years. The project paves the way to enable leaving dead animals in Dutch and Belgian nature and restore the community of species which rely on this food source. 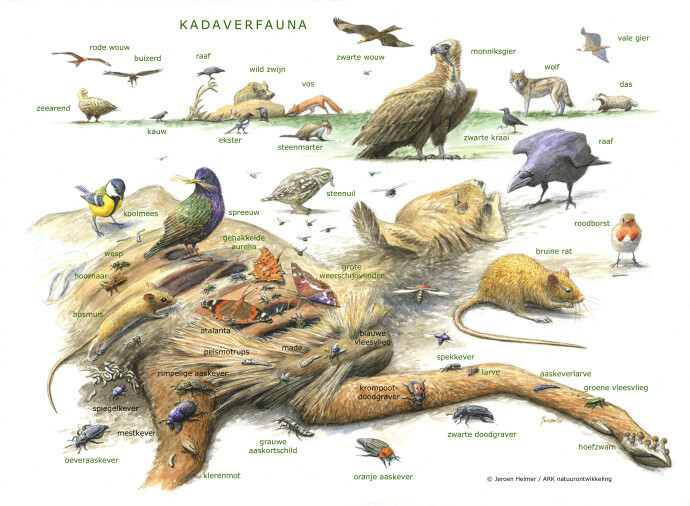 Currently, in many European landscapes there is a lack of sufficient natural food for scavenging species. This is mainly due to the replacement of wild herbivores by livestock, which when dead have to be removed and disposed of according to EU regulations, and in many areas today there are on average low densities of wild prey species. In the Netherlands, road kills of wild animals are also being removed contributing to the cut in the food chain. Bart showed that monitoring of carcasses with camera traps during the past few years revealed no less than 95 species of birds and mammals prospering from them. Also indirect linkages passed such as Little owl eating maggots from carcasses, and Red squirrel taking home fur as nest material. Furthermore, Bart highlighted latest insights into future prospects to be able to leave carcasses including that of semi-wild horses and bovines. Next, Stoycho Stoychev, team leader of the Rhodope Mountains rewilding landscape, provided details on how the restoration of food chains in the Rhodopes takes shape. The Bulgarian Society for the Protection of Birds/Bird Life Bulgaria has been active in the conservation for vultures since the early ’90s. Stoycho explained the problems vultures are facing here like the decrease in abundant livestock as people are moving to cities and abandoning rural areas. Unsafe food due to poisonous baits as well as dead animals containing antibiotics and Diclofenac, poses another great threat for vultures. This area is very important for vulture conservation as three out of four species breed here – Black, Griffon and Egyptian vultures. In collaboration with hunting associations that take responsibility of wildlife management, restocking of Fallow deer and Red deer increased their numbers. Wild living horses have also been released in the area. The Circle of Life is being re-established here once again as the increased numbers of wildlife provides food for predators (wolf) as well as for scavengers who are attracted to the wolf kills. European Rewilding Network (ERN) Webinar about how to restore food chains. Besides that, Stoycho showed that local people clearly benefit from vulture conservation as eco-tourism plays an important role with the vultures being a main attraction for wildlife enthusiasts. One of the municipalities, Madzharavo, nowadays can count on many visitors including wildlife photographers resulting in fully booked B&Bs in May and June. Increasing the local support for conservation is in turn very good for the vultures. Since 2006 the Griffon vulture population has been climbing up steadily with now over 70 territorial pairs being present in the area. After hearing the stories from the field, a vivid discussion followed about the practical issues ranging from the impact of poisoned baits to vultures and the positive effect nature tourism plays to decrease this practice. The second discussion that took place was about the possibilities to enable livestock being left as food for nature. Once again, various valuable ideas passed by during this subject-specific ERN event. More than 40 inspiring rewilding examples from all over Europe will soon be part of the European Rewilding Network. Together, we aim to actively share information and bring the concept of rewilding forward as a conservation approach. Rewilding Europe warmly welcomes new members to the network, as we believe that building and exchanging knowledge on rewilding experiences will be useful to all who want to be part of making Europe a wilder place. Please feel welcome to have a look at how your inspiring rewilding initiative could also become part of this growing network at www.rewildingeurope.com/rewilding-network/.